Are you a Minecraft expert? Confess to know everything about Minecraft? Well now is your chance to prove it! 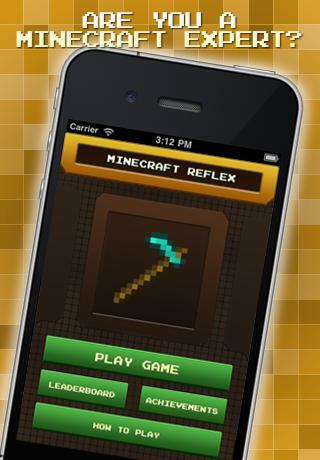 Minecraft Reflex is a unique concept from the creators of Minecraft Explorer for iOS. Simply tap start and quickly guess which item is about to revealed in the grid. Stuck on a question? No problem! Simply tapthe skip button to avoid losing a life! This is an exciting and unique game which is suitable for anyone who loves Minecraft! "Minecraft" is a trademark of Mojang AB. 57Digital Ltd are not affiliated with Mojang AB and are respectfully adhering to the terms set out by Mojang AB at www.minecraft.net/terms.